I grew up eating soul food recipes and didn’t even realize it at the time. As a child, I thought everyone in the world ate the same type of food that we did – fried chicken, buttermilk biscuits, smoked ham, rice, grits, fried okra, stewed squash, and such. Even after I was old enough to realize that southern food was different and special, I still didn’t quite understand the soul food connection – that slaves from Africa introduced many cooking methods and foods to the U.S. South. That’s why it’s almost impossible to separate the terms “soul food” and “southern food.” The two types of cuisine aren’t 100% alike, but there’s plenty of overlap, so it can be confusing even for native southerners. I’m sure it’s even more confusing for folks from other parts of the country. 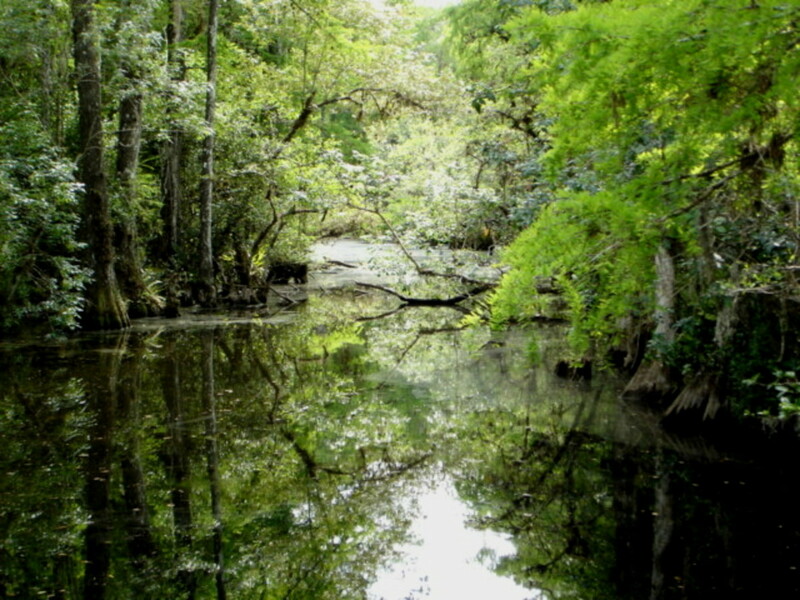 Call it whatever you like – soul food, southern cuisine, Gullah, Geechee, country cooking, or down home food. The term isn’t important. What matters is the incredible flavor! Today I’m sharing with you two great soul food recipes with pictures. Do you want to learn how to cook greens? First, let’s make sure you know what greens are. 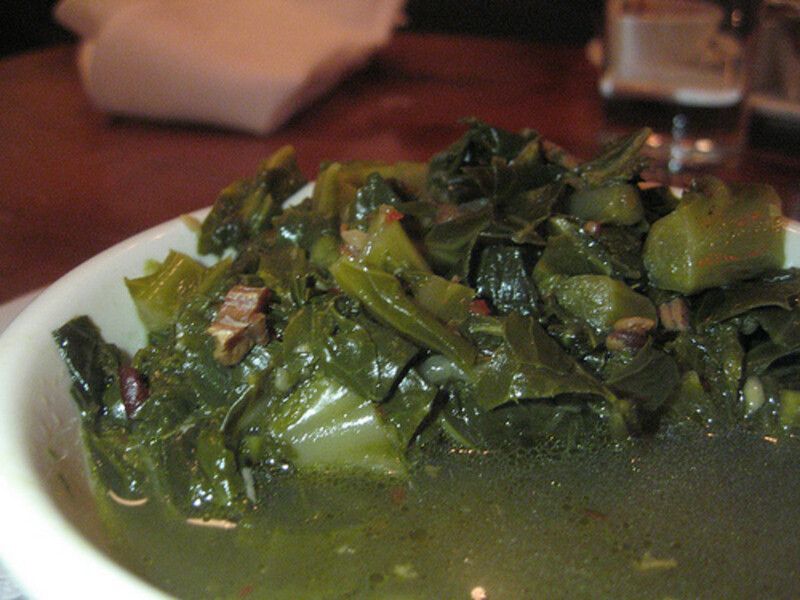 In the Deep South, “greens” means cooked turnip greens, mustard greens, or collard greens. When you buy fresh greens, there’s often a fair amount of work between the purchase and the pot. Greens can be incredibly sandy, and all that sand has to be gotten rid of. I usually fill my kitchen sink with cold water and soak the greens for a few minutes, swishing them around to loosen any dirt and debris. I might repeat this process several times before the greens are clean. Of course, this largely depends on how dirty they were to start with. Once the greens are clean, they need to be trimmed. Large, tough stems need to be stripped away. Once that’s done, the tender parts of the leaves can be torn, cut, or chopped. Now the greens are ready to cook. They can be sautéed, but most older southern cooks prefer the boiling method. 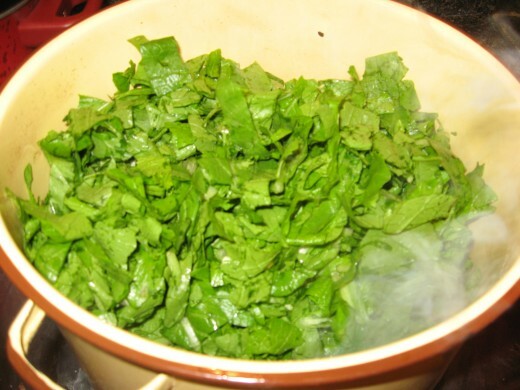 To boil greens, you’ll need a large pot with a lid. A pound of leaves will look like a lot, but they’ll cook down significantly, so don’t worry about having too many in the pot. You’ll need some seasoning, too. 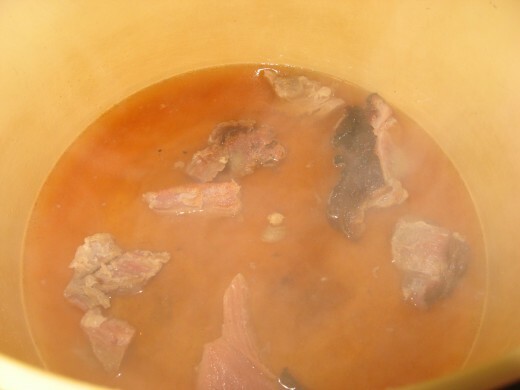 For fat, the tradition is to use bacon, bacon grease, ham hock, or pieces of smoked ham. Other popular seasonings include salt, of course, along with black pepper, red pepper, onion, garlic, and sugar. The greens need to simmer until they’re tender. This usually takes anywhere from 30 minutes to an hour, depending on how many greens you’re cooking at one time and on how tender you want them to be. Seasonings are often simmered for a few minutes before vegetables are added. Many soul food dishes use a lot of seasonings. Because so many slaves had to make do with cheap foods that often didn’t have a lot of flavor on their own, the cooks spiced up their dishes with lots of cooking spices and other ingredients. 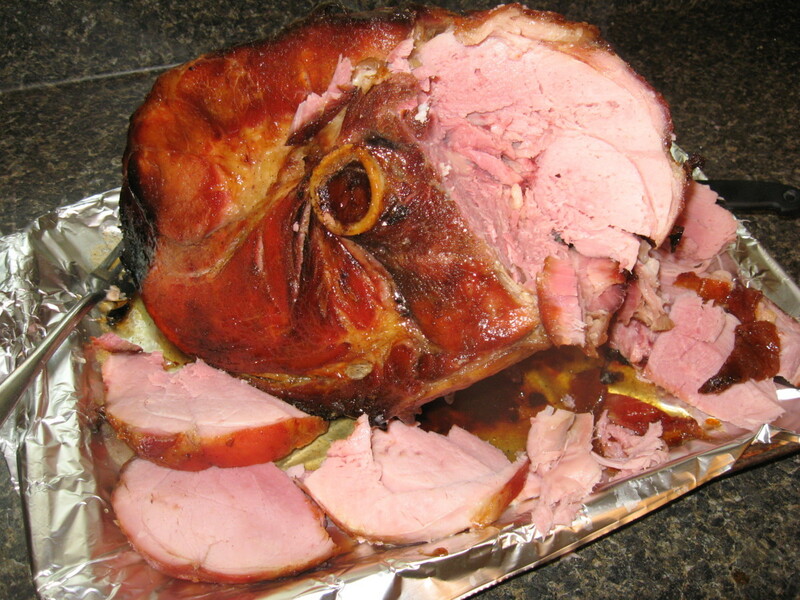 These often included smoked or cured pork in some form. Pigs were pretty cheap to raise, and they didn’t require much space. Plenty of southern slaves kept their own pig or two, and practically every inch of the porkers was used. 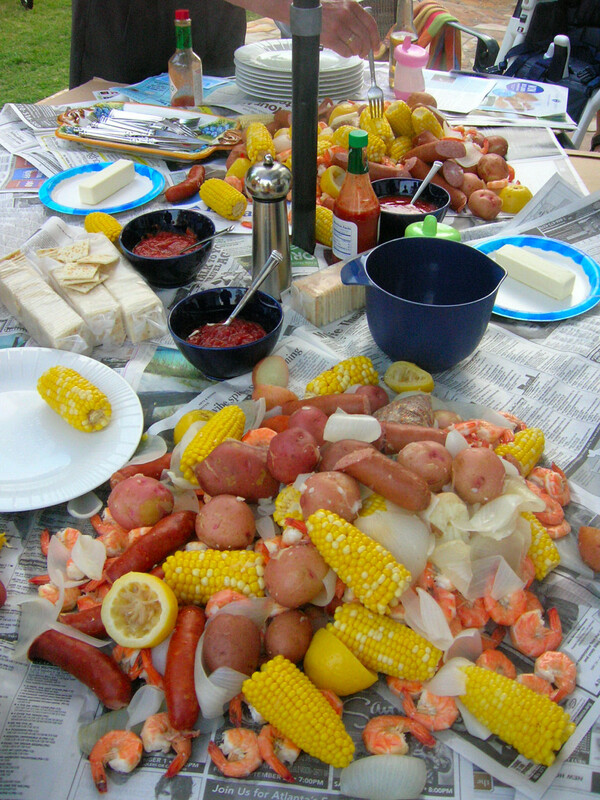 Other popular seasonings included bell peppers, hot peppers, vinegar, onion, garlic, and celery. For sweetness, ingredients might include cane syrup, honey, or molasses. Of course, soul food cooks today have access to all sorts of cooking spices, and they take full advantage of them. Some popular cooking spices you’ll see in southern cooking include cayenne, paprika, black pepper, garlic powder, onion powder, crushed red pepper, thyme, and celery salt. Bouillon is used a lot, too. 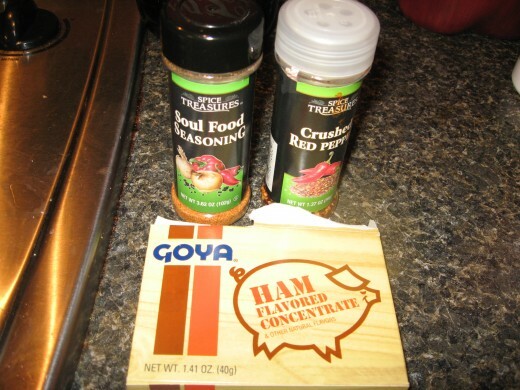 What is soul food seasoning? As a shortcut, I sometimes use a soul food seasonings blend. The exact ingredients in these blends depend somewhat on the brand you use. The one I have in my kitchen cabinets right now includes salt, cayenne, paprika, black pepper, garlic, and onion. Other brands may vary slightly. Why do I call these super greens? I do so because they’re, well…super! The broth is rich, savory, smoky, and tasty, and the greens are tender and full of flavor. 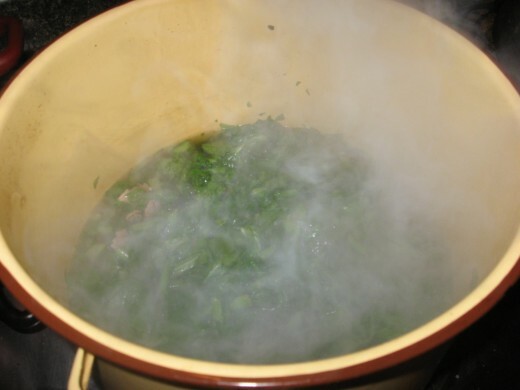 By the way, in the South, we call the broth “pot liquor.” My dad used to say that cornbread was invented with the sole purpose of sopping up the pot liquor from greens. I know this is a tall tale, but greens and cornbread do go together perfectly! 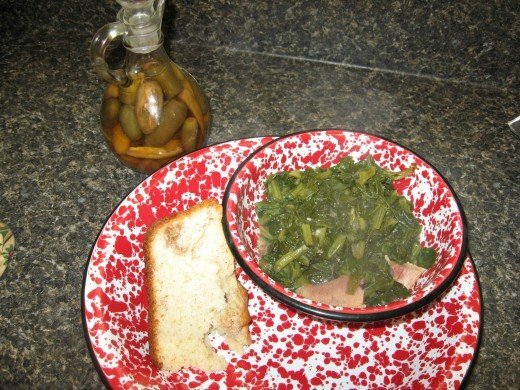 For this recipe, you can use mustards, collards, or turnip greens. Oh, be sure to have some hot pepper vinegar on hand! Thanks for rating my recipe! To a large part, add chicken broth, smoked ham, sugar, ham seasoning, Soul Food seasoning, red pepper flakes, bouillon, and salt and pepper. Bring to a boil. Place lid on pot and reduce heat. Simmer for 10 minutes. Add 4 cups water to pot and return to a boil. Add greens. Reduce heat to medium and place lid on pot. Stir greens occasionally. Continue cooking for about 45-50 more minutes. Drain and serve with hot pepper vinegar. Save the pot liquor for cornbread. If you’re looking for a recipe for cornbread that produces a wonderful brown crust, this is it. Crusty cornbread isn’t as much about the ingredients as it is the cooking technique involved. Actually, the crust is my favorite part. When I was a little girl, I loved my grandmother’s homemade cornbread. It always had a thick, crunchy crust on the exterior. I used to beg her to make a pan of cornbread that was all crust. Yeah, I know now that it’s not possible to do so, but with this cornbread recipe, a nice brown crust that’s thick and crunchy is achieved. Directions: Combine dry ingredients in a large bowl. In a smaller bowl, whisk buttermilk and eggs together. Combine the two. Stir in ¼ cup oil. Pour 2 tablespoons oil in black iron skillet and place on medium-high stove burner. Tilt pan so that sides and bottom are coated. When oil begins to smoke, remove from heat and pour in batter. Bake at 400 degrees for 30 minutes. Cover with a plate. Allow to sit for 5-10 minutes, then invert skillet. Tap on bottom of skillet to loosen cornbread, if needed. I basically follow the same recipe except for the buttermilk. With my cornbread I can never get the thick crust. 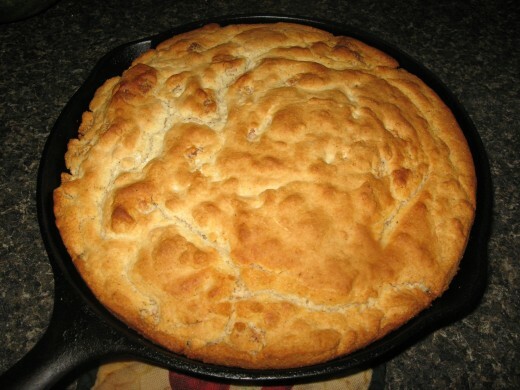 The cast iron skillet produces good cornbread but is nothing more than the typical cornbread in an aluminum pan. I'm with you on the cornbread and greens! We did not put sugar in cornbread when I was a kid (and to this day, it seems like I'm eating cake when I taste it made that way). Sopping up the 'pot likker' was half the fun, too. Yummy! Habee, Wonderful! Yummy! Greens are also especially tasty when you mix several varieties! Thank You! I like cornbread, too, Holle, but only the crunchy, crusty part - which is hard to find. 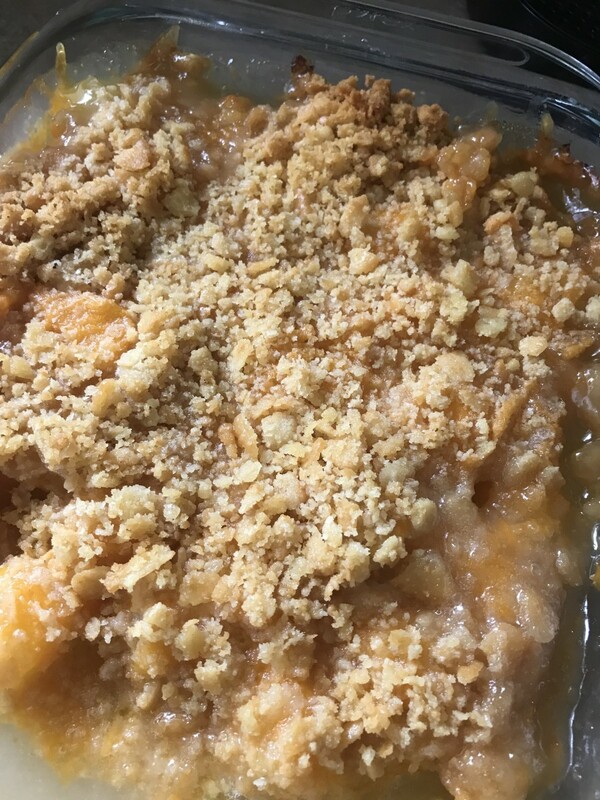 If you ever discover a recipe that is all or mainly crunchy, please let me know. I was raised on beans, pan fries and cornbread. 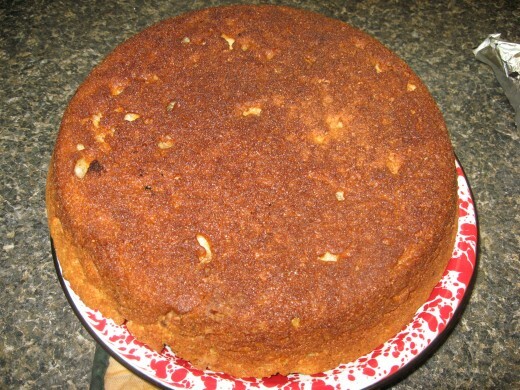 To this day, I still remember in my head the recipe for cornbread that we made every day. I'm not a big fan of greens, but they do taste good the way you have made them here. Thank you for this. Yes I have been eating soul food since was 14. Greens? Don't throw away that pickle juice.